4 players go to the flop - Paul Nguyen, Kathy Stahl, Rep Porter and Duke Lee. 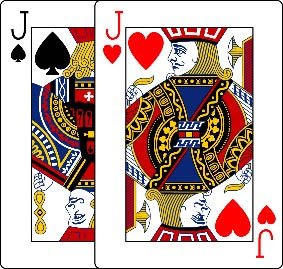 The flop is J♦️4♦️5♠️. 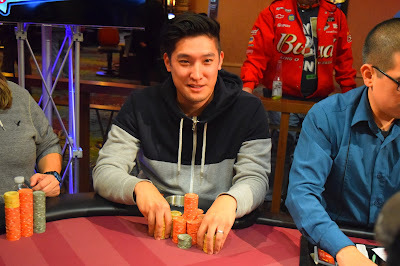 Lee bets 110,000, Porter calls, both Nguyen and Stahl get out of the way. 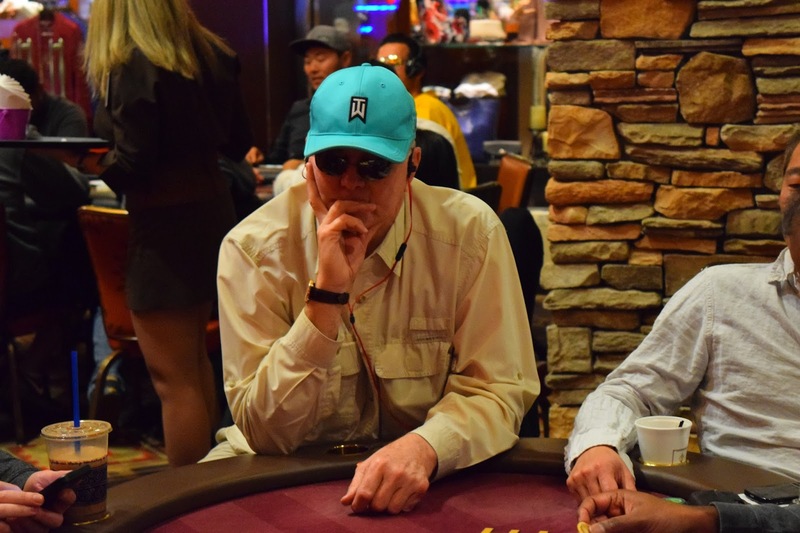 Lee check-calls a 180,000 bet from Porter on the A♦️ turn, and he tank-calls a 360,000 Porter bet on the river. Porter hesitates a moment, and Lee shows JJ for a flopped top set, but the three diamonds made him slow down. 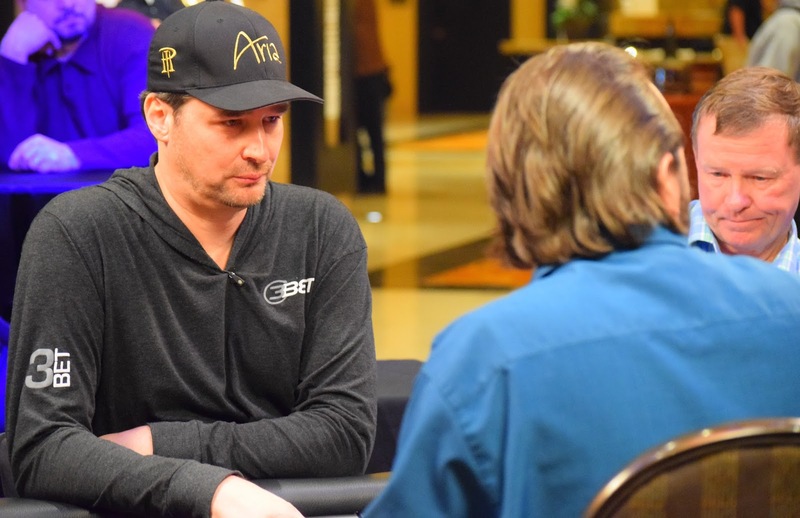 Porter does not show his hand, but the chiplead now belongs to Lee, who was 14/14 on dinner break with just 8BB. He now has 2.5 million with blinds at 12000/24000. Porter drops to 1.3 million. Not a lot of action the last 12-14 hands. A single preflop raise takes down most of the pots, while the occasional 3-bet stops all action and takes the pot uncontested. 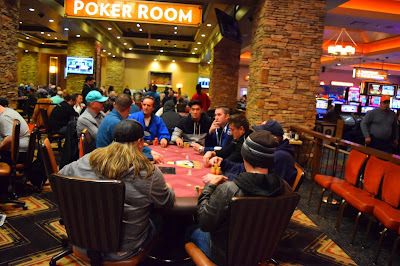 6 players remain tonight - @RepPorter, Kathy @stahly44 Stahl, Paul Nguyen, Duke Lee, Robert Pacleb and Mario Lopez. One is going to bubble and the final five are going to bag up their chips to come back at noon Monday for the LiveStreamed AND televised final table. 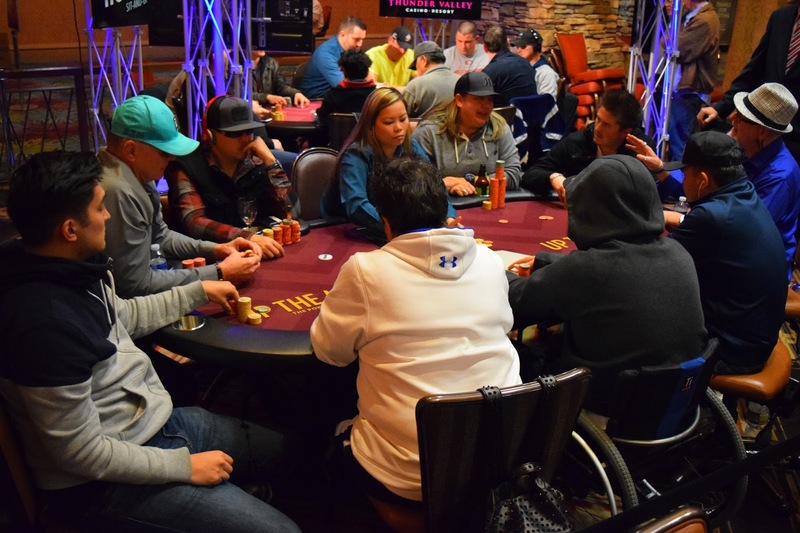 Players need to be here at 10:45am to fill out bio sheets, get mic'ed up and learn their way around the RFID final table. Cards go in the air at noon, with the LiveStream (watch it here on this blog) at 1230 with hole cards. A roller-coaster day for Gina Stagnitto comes to an end as she moves all in from the button with JT and the button, Mario Lopez, wakes up with AK. 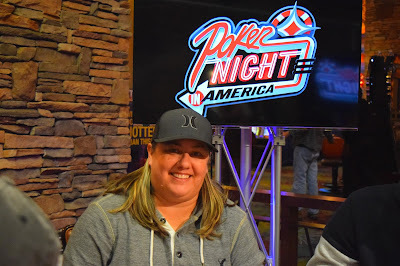 Gina has outs, but none come her way and she is eliminated in 8th place, cashing for $11.847. 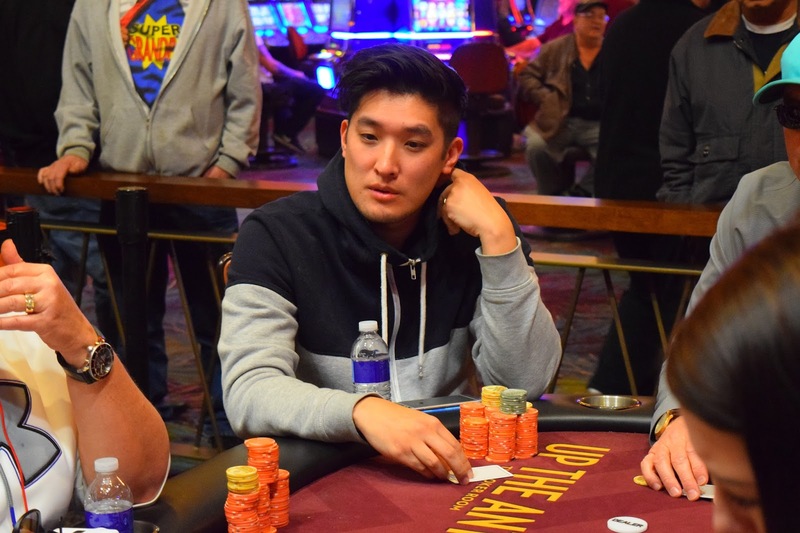 Phuoc 'Paul Nguyen is all in and called by @stahly44. Nguyen shows AK and he's run into Kathy's AA. The flop is QTx, so Nguyen now has a gutshot Broadway draw, but Robert Pacleb said he mucked JJ preflop ratehr than call off his stack so it is a 2-outer draw ... and it hits, J on the turn, both Nguyen and Stahl bolting up from their chairs but for TOTALLY different reasons. 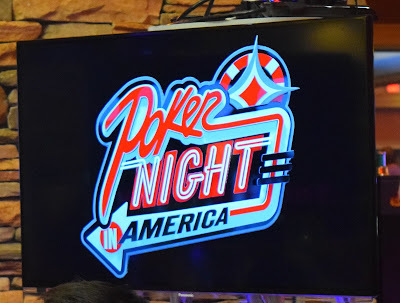 ANNOUNCING: The @PokerNightTV Main Event Final Table WILL be LiveStreamed on a 30-minute delay, with the LiveStream scheduled to start at 12:30pm. Hole Cards and commentary by David Tuckman, Maria Ho and others (likely) with Nolan Dalla and Ben Erwin on the mics tableside. 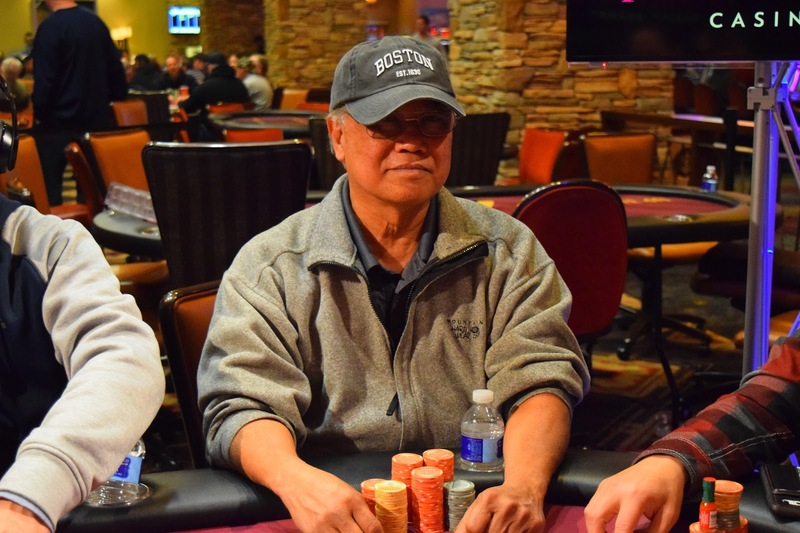 Phouc 'Paul' Nguyen, in his @Bay101Casino hat, bets out 152,000 on the turn with the board showing T♥️4♣️2♣️9♥️ and a pot of about 350,000 out there. 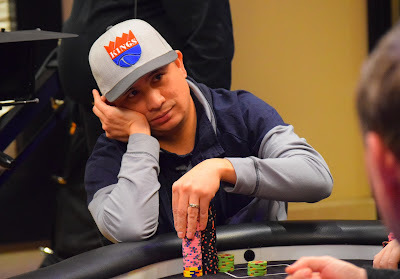 Chuck Nguyen has about 245,000 behind him so the call is effectively for his tournament life. Chuck reluctantly mucks, and Paul shows 44 for a set. Out Goes Gin .. um, WHAT? 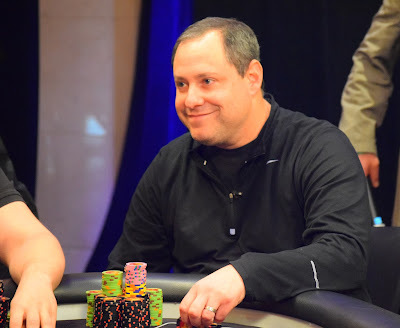 Gina Stagnitto puts her last 271,000 all in preflop and the 2 milly stack of @RepPorter makes the call. Gina is standing up and gathering her gear to leave, as her A♥️8♦️ into the AA of Porter. The 8♥️7♥️4♦️ flop did pair Stagnitto and give her a backdoor flush draw. The Q♥️ made for a real flush draw, and when the 8♠️ hit the river, that made trips and Gina had doubled through Rep.
Three hands in to the FT @Stahly44 goes set-over-set on Theresa Cummings, Three Kings > Three 7's, and Cummings is out in 9th place, collecting $8,875. 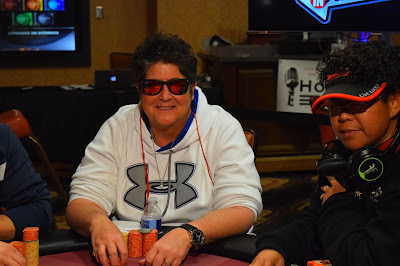 Kathy Stahl moves to about 1.8 million, second in chips and we are two eliminations away from the end of Day 2. The 9-handed Main Event Final Table - in photos, with @RepPorter in the 1 seat and your chipleader at 2,100,000. 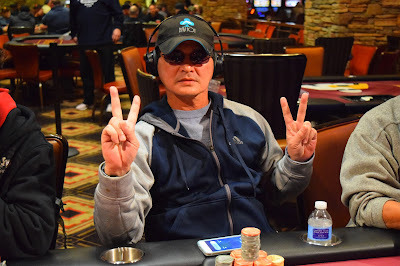 Chuck Nguyen of San Lorenzo is in the 2 seat, he has 285,000 chips. Theresa Cummings of Nevada City is in the 4 seat, with 576,000 chips. Phuoc 'Paul' Nguyen final tabled the 2015 Ante Up World Championships her at Thunder Valley, taking 5th place. 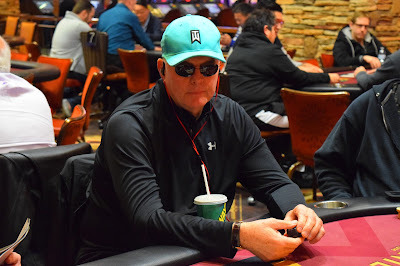 The number 5 must like Paul here, for he is in the 5 seat at this final table, a 1,613,000 stack of chips in front of him. 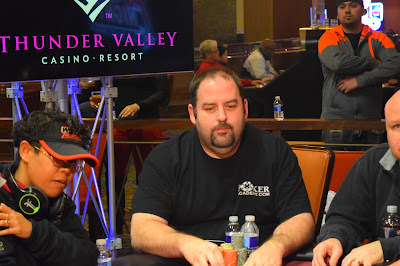 Robert Pacleb came from Vallejo to play the Poker Night in America Main Event. He is in the 6 seat with 861,000 chips. 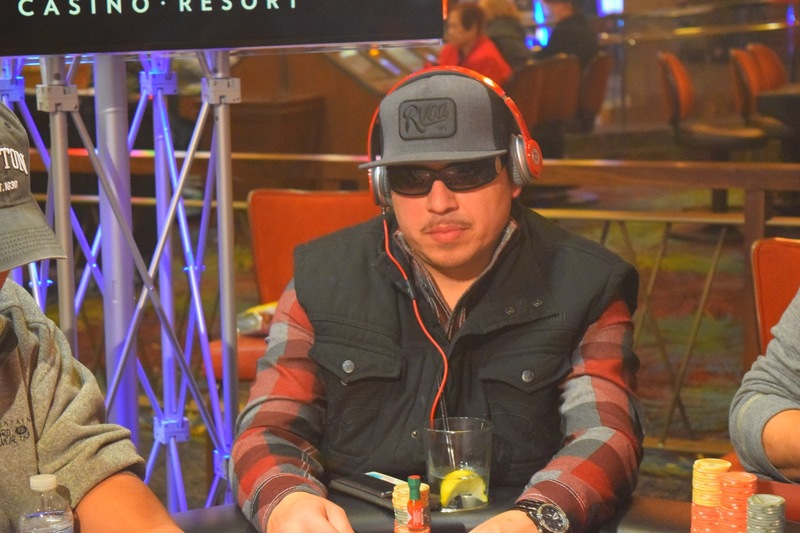 Mario Lopez from Cloverdale has 363,000 chips. he is in the 7 seat. 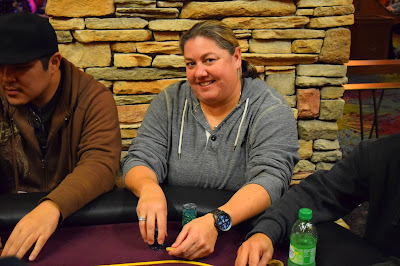 Kathy Stahl defeated a field of more than 900 players here last January to win $62,000 in a $425 DeepStack. Today she is in the 8 seat, with 1,210,000 chips. Duke Lee, the defending HPT Reno champ, was 14/14 on dinner break with just 8BB. 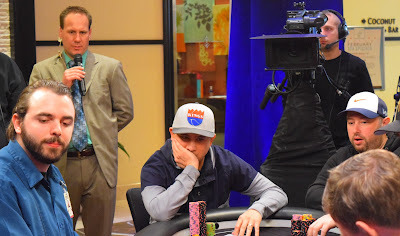 He comes to the final table with 849,000 chips and is in the 9 seat. @sbrounder Tom West ran his QQ into the JJ of Theresa Cummings before dinner break. 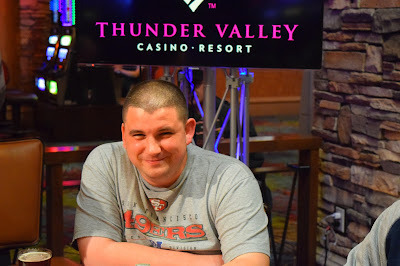 This time he ran 66 into her KJ and she drew out, knocking out the reigning Thunder Valley HPT champ out in 11th place, on the unofficial final table bubble. West cashes for $6,465. 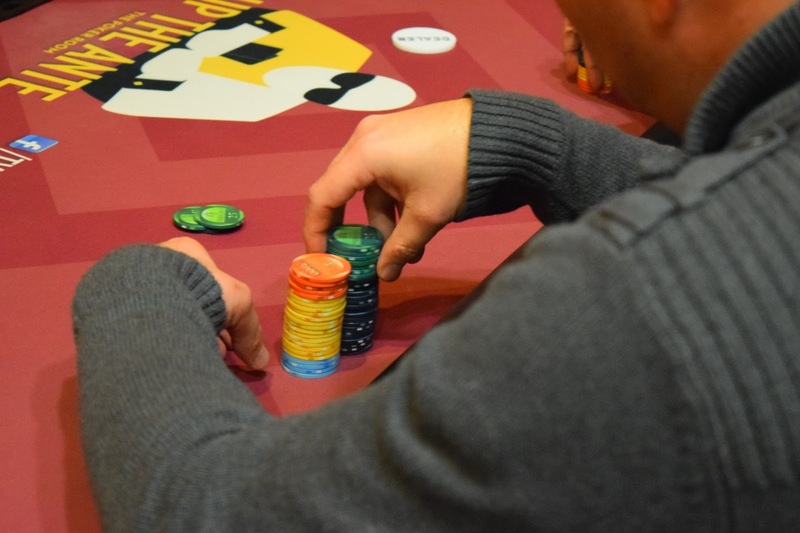 We'll have updated chipcounts for the final table folks in a few minutes. 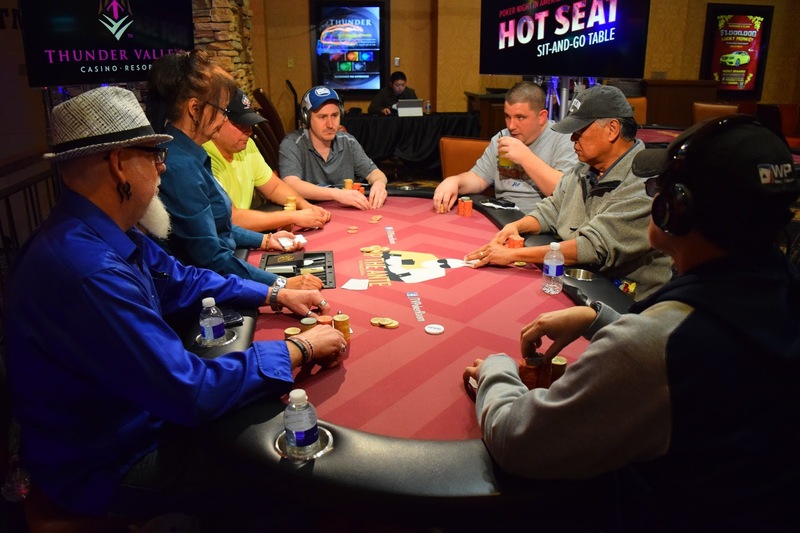 They're in to their 16th mile (level) without a break, and 7 players remain - including Reno's Lance Donnell of the Peppermill Poker Room (pictured lower left) - in today's $150 Marathon, playing at 600/12000 right now. 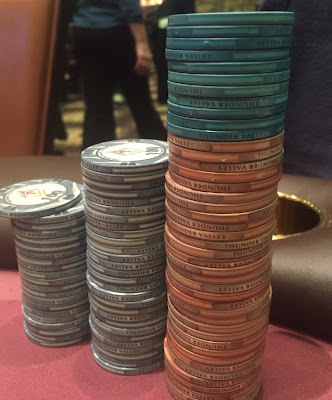 Mile (level 17) is coming with blinds of 8000/16000 and 2000 antes. Former Thunder Valley HPT Champ Joe Christman is the latest @RepPorter victim. 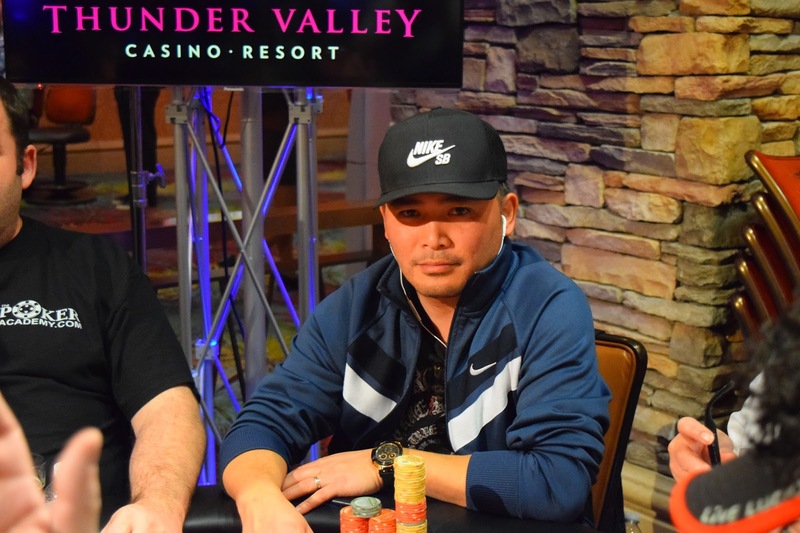 Christman is out in 13th place, cashing for $5,301 while Porter climbs to 1.75 milly, better than 600k ahead of 2nd place Phuoc Nguyen. 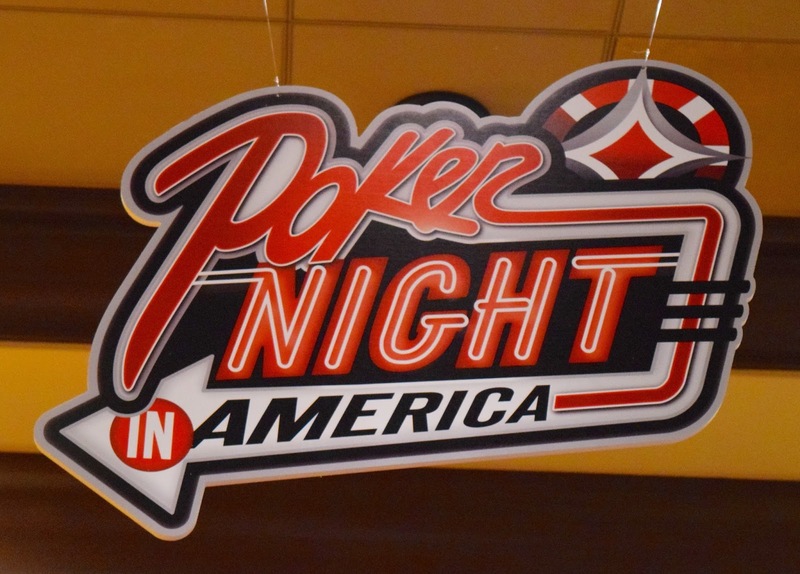 - Here is the PayTable for Event 13 of the @PokerNightTV- The Tour Series - $100 Hold'em with $25 bounties. Duke Lee was at the bottom of the chipcounts when players left for dinner break. 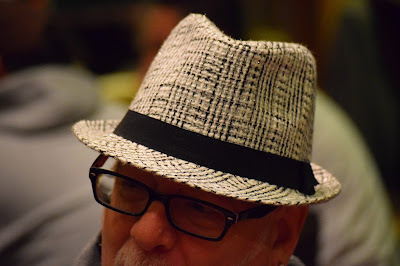 His 96,000 was good for 8BB. 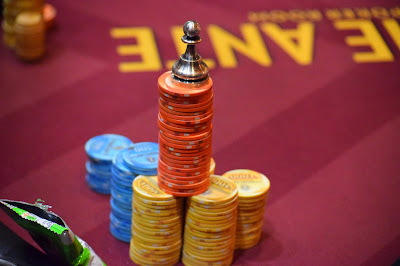 We lost focus on Duke while watching other stacks climb and shrink. Now we take a look and not only is Lee still in the running, he's moved up 850% to 815,000. Lee, the 2015 HPT Reno champ, is looking to make this his biggest score to date - he took home $59k for the Reno win. Here are estimated unofficial chipcounts for the remaining 13 players, led by @RepPorter. Down to about 10BB with 20 players left, Mike Harvey just knocked out reigning @WPT @Bay101Casino Shooting Star champ Taylor Paur to move up to 615,000. 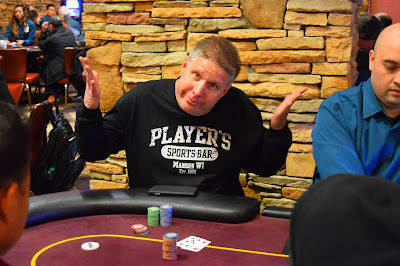 Paur, who followed up his $1.2 milly Shooting Star title with a 3rd place here in the WPT Rolling Thunder Main Event 6 days later - cashes tonight in 14th place for $5,301. Tom @sbrounder West leads out and Paul McCaffrey flats from the button. 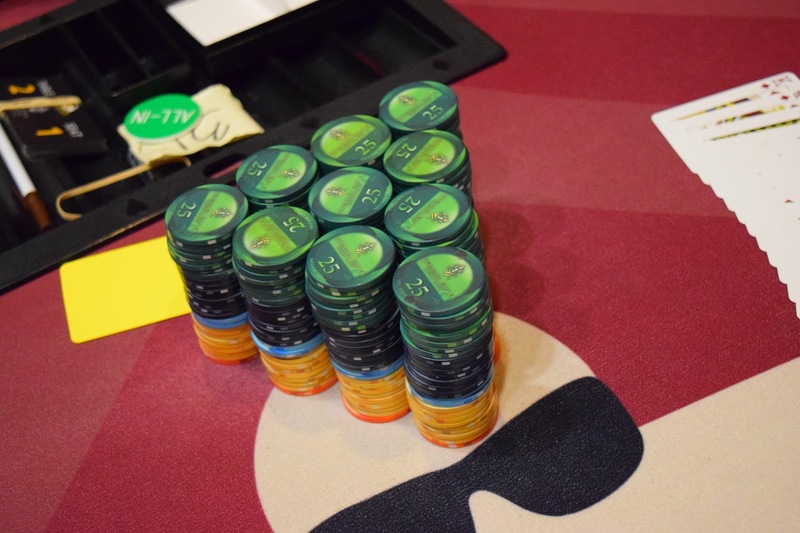 The flop is Q-9-4 and West bets out 45,000. McCaffrey makes it 126,000. West 4-bets all in and McCaffrey snap-calls. The board runs out K-2 and West has McCaffrey barely covered. 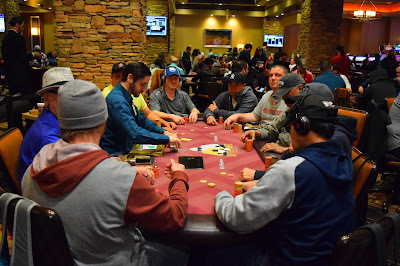 .. and everyone else is along for the ride with @RepPorter as he begins hammering away at the stacks of the other players here in the $1650 Main Event. 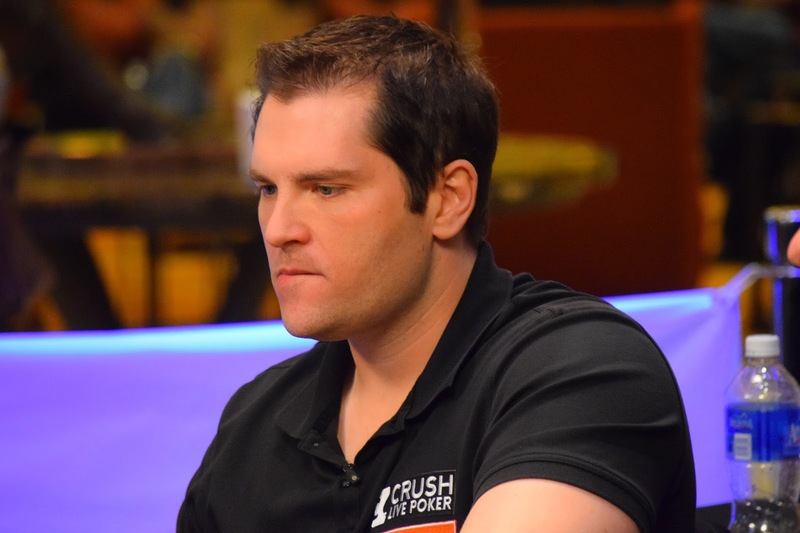 Porter now has 21 percent of all the chips in play with 16 players remaining. 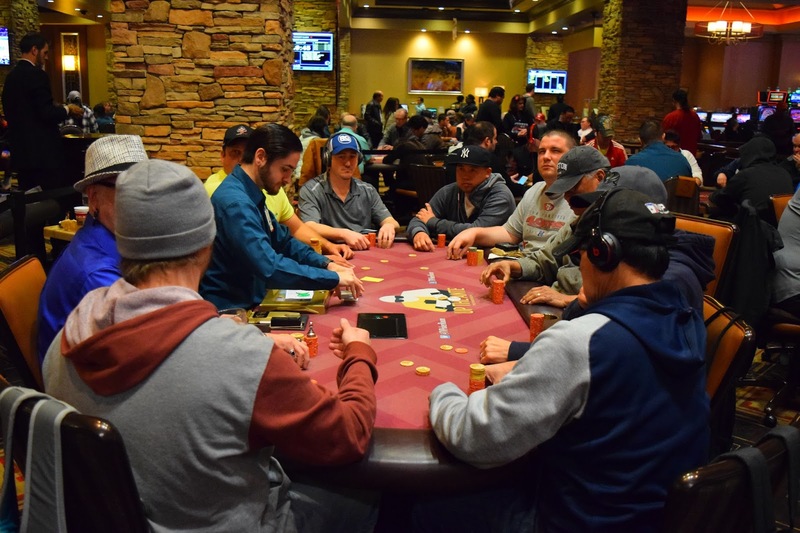 Play continues tonight until 5-handed. The remaining 5 bag-n-tag then move over at noon Monday into the Thunder Valley hotel lobby where Poker Night in America has its television set built to film the Final Five. The chipleader extends his lead a few hands back from dinner break, as Rep Porter KO's Napa's Rick Troendley. 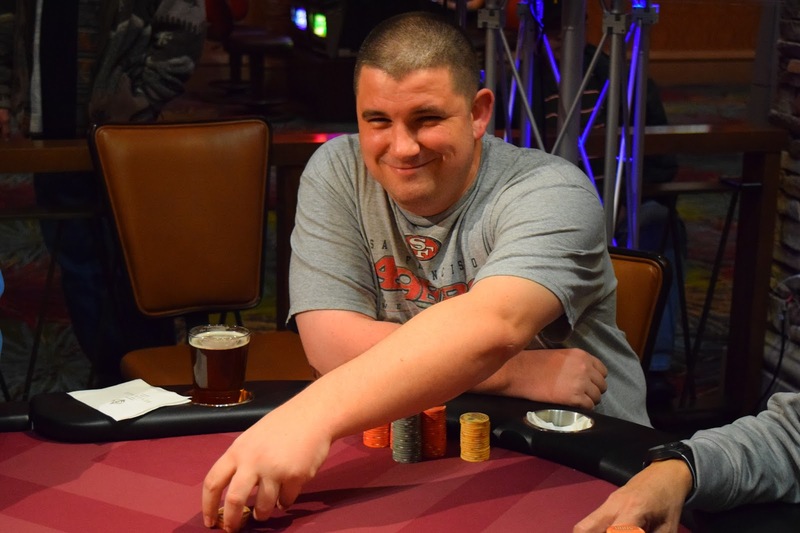 The knockout moves Porter to more than 1.5 million, and a 700,000-chip lead on second place. 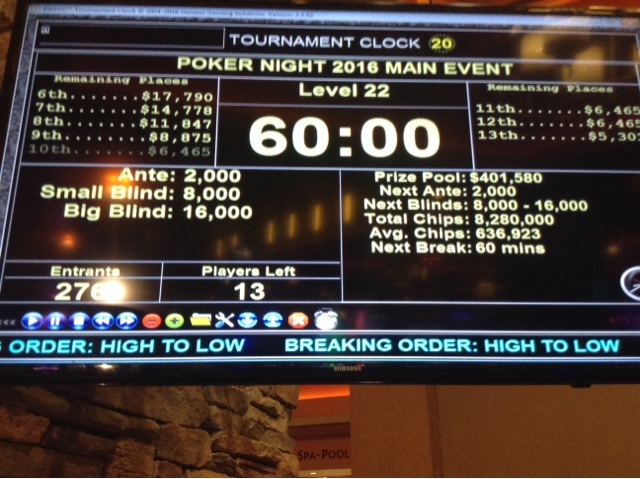 Here are the official chipcounts for the 17 remaining players in Day 2 of the @PokerNightTV $1650 Main Event. 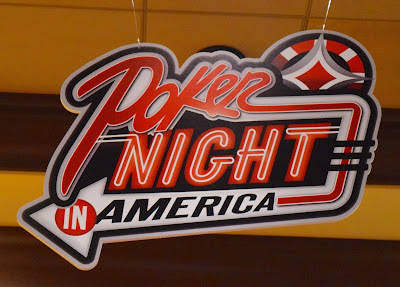 Play continues tonight until 5-handed. The final 5 bag-n-tag to come back Monday at Noon for a final table being filed to be shown later on CBS Sports Net as part of an upcoming Poker Night in America episode. 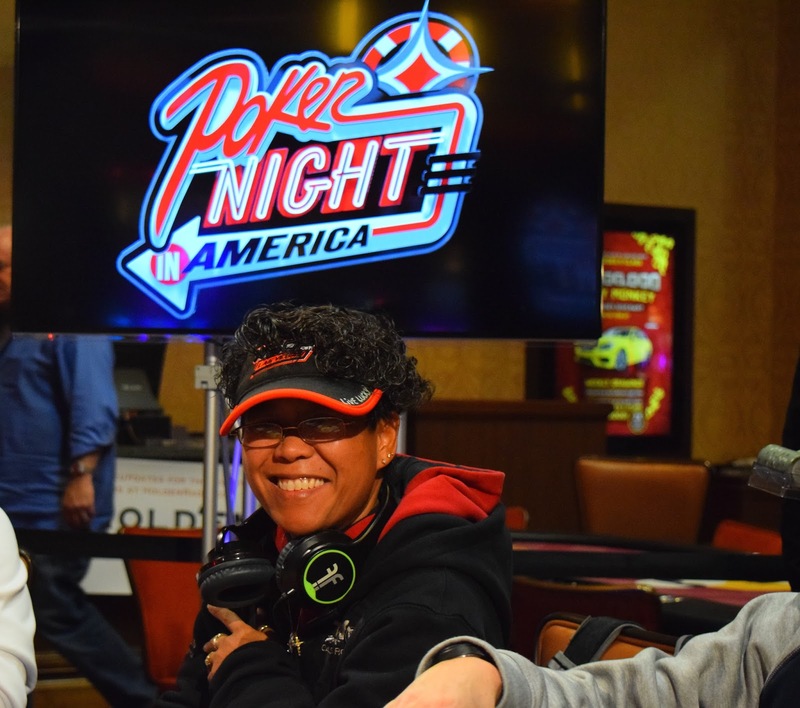 Theresa Cummings moves all in for her last 202,000 and Joe Christman makes the call. Tom West, however, moves in over-the-top for 312,000 more than Cummings. Christman still has close to a quarter-million behind if he calls ... and he does. West likes the 6-T-4 flop, but he doesn't particularly care for the J turn that gives Cummings a reason to cheer. Christman like it the least, and when the board pairs the T on the river is it Cummings with the triple-up, West adding to his stack and Christman going from chipleader down to 18BB. Players are now on a 60-minute dinner break, we'll be doing full chipcounts on break. 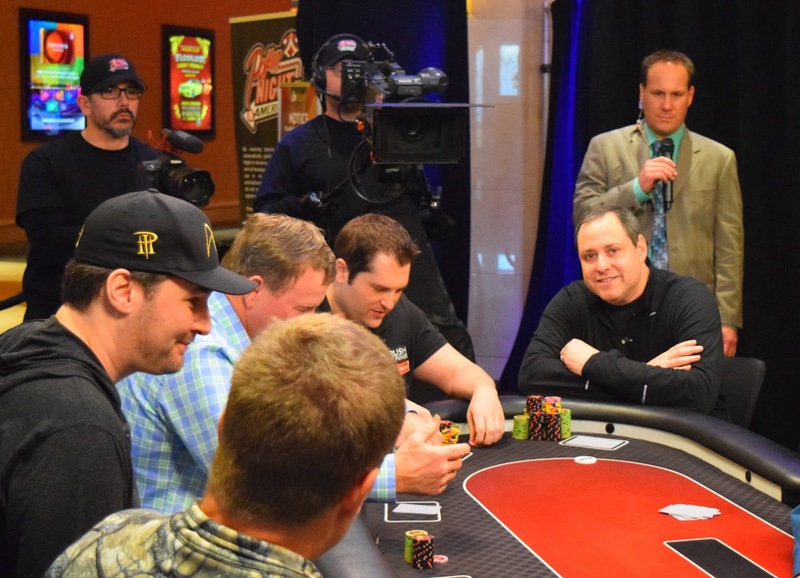 Here are the final 2 tables in the @PokerNightTV Main Event. 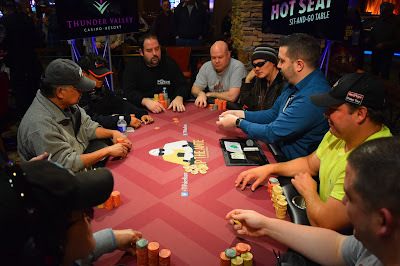 Above at the feature table we have (from lower left) Phuoc Nguyen, Paul McCaffrey (who leaned out of camera range because his wife doesn't know he is here) Robert Pacleb, Theresa Cummings, Rep Porter, James Ohwieler, Joe Christman, RIck Troendley and Tom West (lower right). 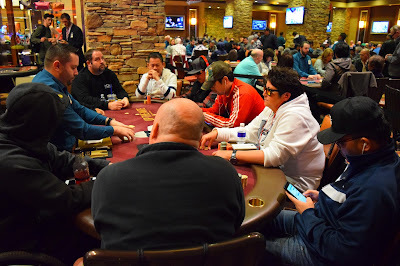 Here are the players who cashed in 19-27th place in today's Main Event. Steve @kepano808 Kujubu moves all in for his tournament life and is called by @DanielM49805247 McGee. 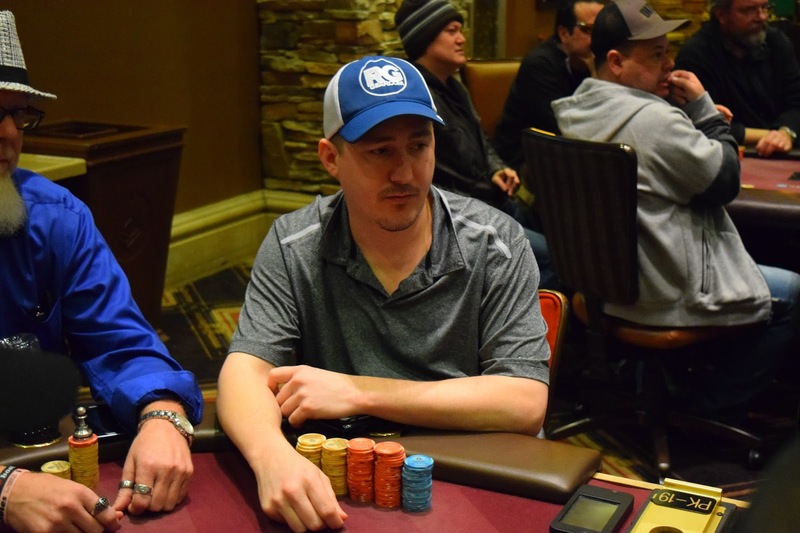 Some paint hit the board, but it is a K and Q, the nine's hold and Kujubu is eliminated in 21st place, cashing for $3,976. We lost Mark @P0kerH0 Kroon, @Dalton @PlzFold Still and @lucasfrid Fridriksson in 25-27th place shortly after the redraw to three tables. All three cash today for $3,131. The next three eliminated all cash for $3,534.